According to some texts, Hecla or Hekla is the Icelandic word for ‘cloak’, and comes from the German word ‘hexe’, which means ‘witch’. Mount Hekla is 1491 m high located in the south western part of Iceland about 70 miles (110 km) south east of Reykjavik and 35 miles (55 km) inland from the southern coastline. It is Iceland’s most notorious volcano, sometimes referred to by the natives as the Gate or even Gates of Hell. 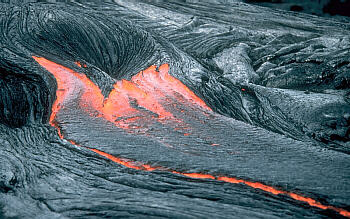 It is regarded by some as a stratovolcano, but others argue that it more closely resembles Hawaiian shield volcanoes. It is one of the world’s most active volcanoes and has terrified the inhabitants of Iceland since it was settled by Ingolfur Arnarson. Hekla' s ash is not really ash at all, but tephra, “ a lightweight material containing silica, like a very small grain of sand containing bubble cavities which have dissolved acidic salts attached to the surface as a precipitation”. This tephra is known to have great healing properties. Hekla Lava provides healing and relief for bone problems. It is a remarkable remedy for Plantar Fasciitis and Heel Spurs. Hekla Lava also provides relief for heel pain, neuralgia, toothache, jaw pain and other nerve pain. Hekla Lava should be part of your health program for osteopenia, osteoporosis. Kathryn Jones, Health Counselor, suggests Calcarea Phos and Hekla Lava be used together to strengthen bones and improve bone density. Hekla Lava acts upon the jaw and is an important remedy for dental sensitivity, gum abscess, and tooth decay. Hekla Lava is also used to relieve abscess with facial swelling. Hekla Lava lessens swollen glands. Hekla Lava is listed as a remedy for problems with nasal polyps; ulceration of nasal bones; tumors; necrosis and sinus problems after mastoid operation. This remedy works equally well on humans and animals for bone spurs. Hecla lava is considered a small remedy in the Materia Medica. Never the less it is a deep active remedy... of course, it comes from deep inside the Earth!